The Solar Eclipse Folding Concealed Scissor is perfect for any of us who live on-the-go lifestyles. How many times have you been out and about, and needed a small pair of scissors? For me, about a billion times! 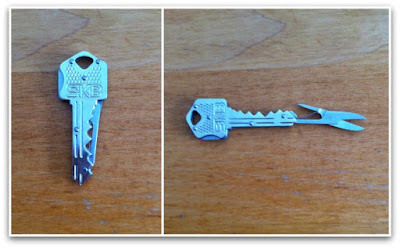 The scissors are enclosed inside a key that is the size of a standard house key, so they are super convenient to carry. And the scissors have a safety-lock feature so you don’t have to worry about them randomly opening up. To open, you simply push the side button and the scissors stay open so that you can get that job done. I have to point out … get it … point out – that I wasn’t expecting to be too impressed by this gadget, but the scissors work, this fits on my keychain and they make the perfect stocking stuffer! You can get your own Solar Eclipse Folding Concealed Scissor Key for $9.99 on Amazon!